Pursuing equilibrium and harmony between human and nature has always been a key concept in Chinese aesthetics. When it is embodied in the art of jade carving, fitting the design to the material and its inherent property is an important guiding principle. This principle means that rendering the theme and design of the work following the natural hues or forms of the material. 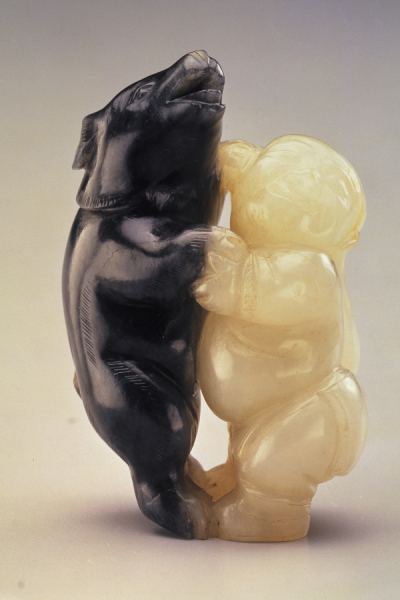 In the family of jade, either jadeite or nephrite exists in a variety of hues. 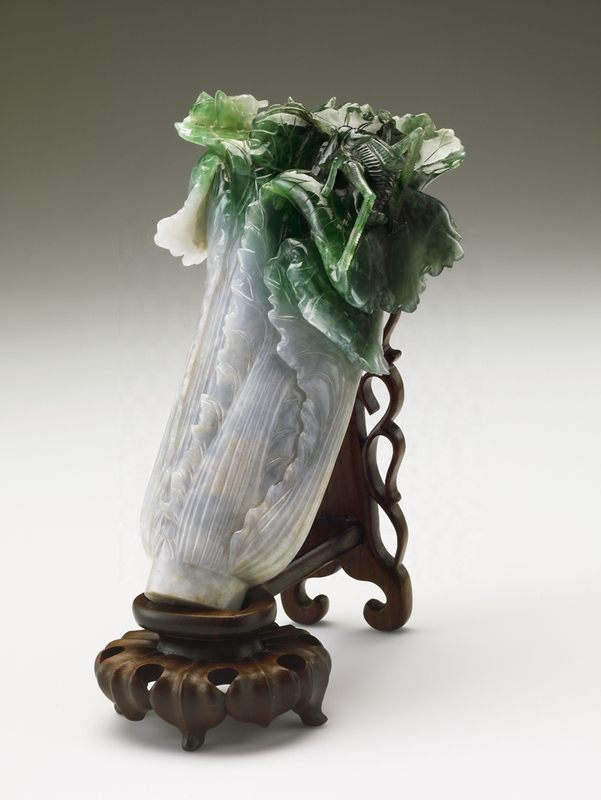 Nephrite jade, aside from white, also comes in yellow, gray, black, brown, green, green-blue, etc. And the various colors of jadeite include emerald green, pure white, titian red, mauve, etc. The artisan fully contemplates the shape and colors of jade at hand, which seem to restrict yet actually challenge him and ultimately inspire his creativity. 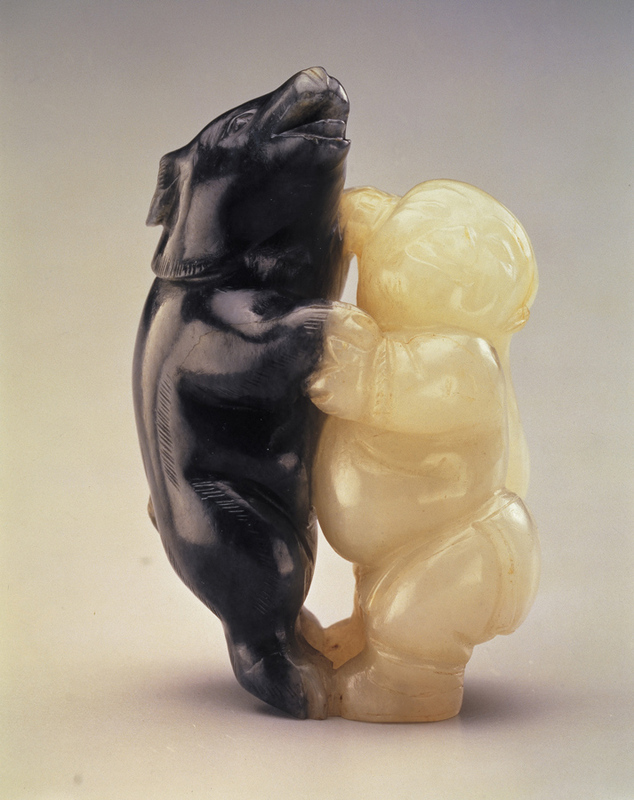 Such design technique is called “cute use of colors (俏色)”, as it takes advantage of naturally-formed color spots or skins on the jade and transforms them into fitting parts of the intended subject. The results are often surprisingly original, but at the same time so aptly natural that works like these are considered very “smart” and called “ingenious carvings (巧雕)”. The motifs of such carvings take on a great intriguing variety, from auspicious signs, figures or animals, to flowers and birds, sometimes even featuring vegetables and meat. Among all smart carving curios, the jadeite cabbage of the Qing dynasty probably reigns as the most popular and impressive one. It embodies a perfect three-in-one union of intrinsic nature, human creativity, and symbolic significance, indeed a paramount beauty illustrating the oneness of human and nature.